Katnook’s rich history stretches back to 1896, when Coonawarra’s first vintage was crafted in their Woolshed by entrepreneurial wine pioneer, John Riddoch - who immigrated from Scotland. He recognised the enormous potential of the maritime climate and unique terra rossa soils which now define Coonawarra wine styles. Lying in the heart of Coonawarra's finest soils, Katnook’s vineyards are within the Coonawarra GI (Geographic Indication) region of South Australia. Steeped in heritage and tradition, Katnook Estate wines epitomise 'Classic Coonawarra'. Since 1980, these single varietal wines have been crafted with fastidious attention to detail. They are finely balanced wines with concentrated fruit flavour and great regional integrity. Delicious now with fine cuisine, Katnook Estate wines will reap the benefits of many years cellaring. Their best known Estate wine, the Caberent Sauvignon is listed in the Excellent category of Australias prestigious Langtons Classification, which says of the style, Katnook Cabernet Sauvignon reflects its strong Coonawarra provenance with plenty of intense blackcurrant, mulberry fruit definition, mid palate richness, finely grained tannins and excellent flavour length. The wines have medium to long term cellaring potential. Matured for 17 months in 45% French (9% new), 30% used American oak and 25% in tank. 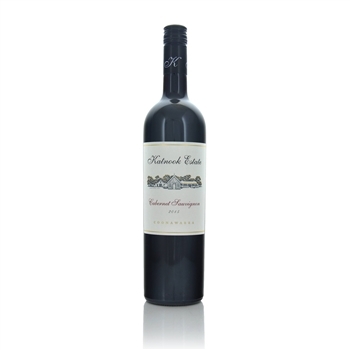 Good hue, although not particularly deep; an attractive medium-bodied cabernet with cassis and mulberry fruit to the fore, tannins and oak playing a pure support role. Well made.​ Drink by 2029.